On my very first retreat with high school students a beautiful image entitled “The Sower” mysteriously appeared on the cover of my binder. To this day I have no idea how it ended up there, but the picture accompanied me throughout my career as a youth minister. The pierced hand of the Risen Christ, seeds flying out from between His fingers, reminded me that Jesus was the Sower; I had only to walk beside Him and do what He did. But rather than be consoled by His invitation to walk together through ministry and life, I worried over the birds that landed on the path and pecked away at the freshly planted seeds. I despaired over the heat of the day when it zapped my newly sprouted seedlings. I wrestled with the weeds that threatened to choke my efforts. I lived backwards. I spent a lot of time in the past, wondering what I could have done differently to help that teen understand her infinite value, what I should have said to that guy who made me feel so small, why that relationship didn’t work out. 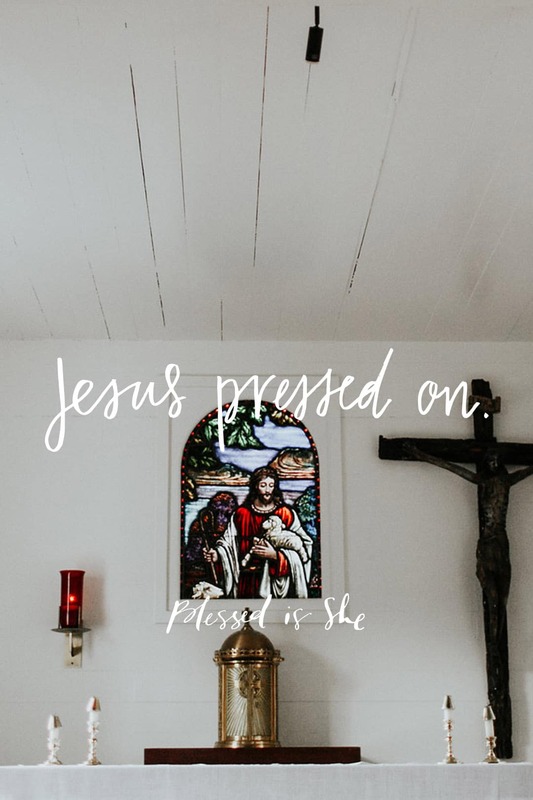 While I stood unmoving on the path, stuck in my head and stuck in my past, Jesus pressed on. The parable in today’s Gospel reminds me of the prayer of Saint Padre Pio. “My past, O Lord, to Your mercy. My present to Your love. My future to Your providence.” (source) With Christ, we don’t have to worry about what lies behind. If there’s a sin of your past that causes you to wince with remembrance, confess it. If it’s a desire unrealized, ask Him again. Whatever causes you to look back, look instead to Jesus who is forever walking with you and share it with Him. Bring the pain of the past to Jesus in this present moment. You will be met with only love and understanding. Only then can we move forward, always forward, with trust and confidence. Thank you for the beautiful reflection! That is such a great prayer from Padre Poo!